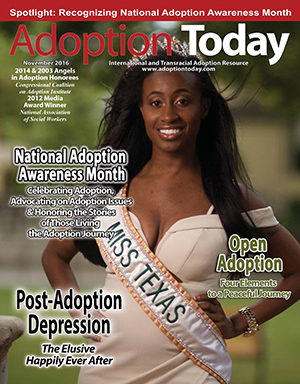 Click to purchase full magazine and support Adoption Today and Foster Parenting Today. After thirty years of living, loving and laughing with persons living with fetal alcohol spectrum disorders (FASD) the most sound advice I can give to foster, kinship and adoptive parents is “FIND TIME FOR YOU.” The person’s constant need for understanding, advocacy and support can easily become overwhelming. If you don’t rejuvenate yourself you will have a hard time adapting your environment creatively, seeking out safe places for redirection and acting proactively versus reactively. Be good to yourself, squeeze in three to five mini-breaks each day. You will be surprised where you find the time and space – filling your gas tank, waiting for an appointment, waiting to pick up a child in the car, folding laundry – allows this precious time to become your sacred spaces of restoration. Switch thoughts to your breathing. Take two deep nasal down to your belly breaths, exhale longer than inhale and imagine your stress being purged out of your body on your exhales. Scan your body for tenseness. Start at your toes and fingers and work up to your central axis. If you feel a tight area, shake or wiggle to loosen it. Gently rotate your head in a circle and roll your shoulders forward. Switch your head rotation. Imagine a pleasant thought – experience, place, a good friend. Smile – as you think about this. Smiling helps release tension. Take a few deep breaths through your nose and return to your activity. Find something you can do each day for ‘you.’ It doesn’t have to take a long time. Use the minutes you have available. If you want to play an instrument – play in a five-minute block of time when you can, you will notice the difference in your ability. If you are a gardener work in small blocks of time planting or weeding– piece by piece the garden will become beautiful. If you want to exercise—do leg lifts as you brush your teeth, roll your shoulders as you type at the computer, get some light 2 lb. weights and lift them as you talk on the phone. If you have a significant other, take a class, participate in a hobby or go to a support group together with other adults. Have fun. If you want to learn a language or memorize versus – choose one sentence or one verse and work on that until you have it complete. You will be surprised how fast the word knowledge piles up. Twice a day give yourself a time boundary vacation. The time will vary – some days it may be five minutes and other days you may get fifteen minutes. Allow no meetings, emails, phone calls, child interruptions or worries. Pay attention to yourself. Challenge yourself to find 50 simple ways to be nice to you! Write down 50 things you enjoy – that’s quite a lot so you will need to take time to think of things you might like or used to really enjoy. On hard days the list will help you be nice to yourself. My list includes: take a hot shower, drink a cup of tea, or hide in the bathroom for five minutes with a good book. Laughter is good for you. Laughter improves your blood circulation, exercises your abdominal muscles, increases your heart rate, expels stale air from your lungs, aids digestion and releases muscle tension. After a bout of laughter your blood pressure drops to a lower level. While stressful situations release cortisol and aldosterone, laughter does the opposite. Take a deep belly breath and play with your face. Feel the difference in your countenance as you smile and breathe, frown and breathe. Our facial muscles contain direct linkages into our emotions. Play with your body language and face as you practice the universal six basic emotions: happiness, sadness, anger, fear, surprise and disgust. Go back to smiling. Parents of brain injured children need to smile a lot. Not only is it good for our children and their growth, it is good for our health. Give yourself the gift of little things. Bring your full attention to a common task. If you are sweeping the floor pay attention to how your muscles are working, how many little silly things you are discovering in the pile growing with each sweep. Listen to the sound of the bristles of the broom. Notice how the floor looks. Write your finger on the dusty furniture and see if anyone notices, then pass out dust rags and let the kids erase your notes. When the shower steams up the bath mirror write, “I love you messages.” Pick some wildflowers and add them to your counter or table. Make letters out of pancake batter and dish a child’s name, on to their plate. Place a chair by a window with sunlight. Take a five-minute walk in the yard or sit outside and drink a cool glass of water. In cold weather enjoy hot cocoa with marshmallows on the steps. If you live where there is snow catch some falling flakes on your tongue. Focusing on my breathing helps me think before I act when I am under stress or anxious. During the day place your tongue on the roof of your mouth, slowly fill your lungs through your nose, then slowly release the air through your mouth. Imagine the air going in and out. Close your eyes and relax. Notice how your body feels. What sounds do you hear? What is the temperature? Is there a breeze? What do you smell? Take a moment. Sit in a comfortable chair, straighten your back relax your shoulders and take a deep breath. Let the air “open” your chest. Hold the breath. Then exhale every last puff. Give yourself freedom to complete 5% of a project – if you give yourself 20 opportunities you will be all done. Place your fingertips just in front of your ears and make all your facial muscles tight. Hold for five seconds and exhale and say ahhh. Let your jaw go loose. Repeat three more times first using half the original tension, then a fourth and finally an eighth. One of the gifts I was given was by friends in Australia was learning to acknowledge a situation as a worry, but don’t lay claim to it. Statements such as “It’s a worry” or “That’s a worry” make it clear that it is something to ponder, but you needn’t get upset or increase your own personal stress level because of it. Jodee Kulp is an author or co-author of 12 books on FASD, a tireless advocate for persons living with FASD, co-founder of RealMindz and the developer of the Live Abilities program designed to change thinking and help adults living with FASD soar. This entry was posted in CALM, CHALLENGE, CONDITION, Jodee Kulp and tagged adoption, children of trauma, FASD, foster care. Thanks Laurel – feel free to SHARE and pass them on – we are all in this together! 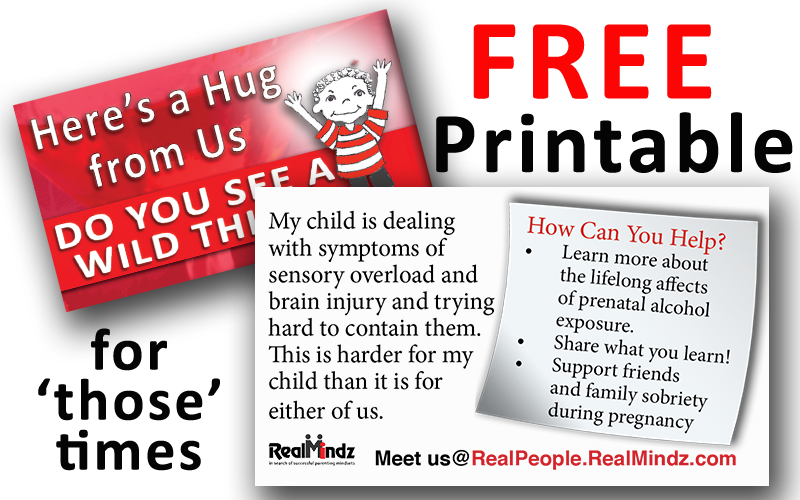 As a mom with a 32 year old daughter with FASD which was discovered at age 25, I did not realize the effect that 24/7 parenting had taken until I became ill. I had to step back from a few commitments in order to take care of myself. I believe this article is extremely important because we are in it for the long haul. I also think this stuff should be taught in school, and modeled by parents so that no one becomes a parent without a keen understanding that self care is as essential to health as food and water. Thank you for this.